The Duchy 20 Race once again took place at the beginning of March after a six year break. 77 (Redruth) Squadron has traditionally helped with the water stations at this event and Hayle Runners once again asked for their support. On a grey, wet and windy morning, 200 runners took part in the race. Cadets manned four water stations along the route which started at Pool, Redruth, and consisted of 2 loops of road running, the first loop of 13 miles followed by a slight shorter second loop of 7 miles. Perfect timing for runners preparing for the London Marathon! The organisers were promoting this race as a plastic free race and the runners had been provided with foldable cups which cadets filled up as required. 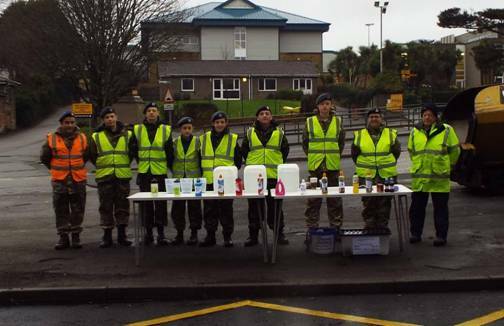 Hayle runners said “We are very grateful for the significant help from local cadets who helped us with the water stops”. In May the Squadron will also be assisting the Rotary Club of Redruth with water stops for the Annual 10k Great Flat Lode Run which starts and finishes at King Edward Mine in Troon, Camborne.